Zaytinya–My Last Lunch in D.C.
Once upon a time, I made a last minute trip into Washington, D.C. to check out a certain museum exhibit. After my visit, I was quite hungry and made a stop at Zaytinya at the advice of two facebook friends. They gave good advice. The place looked swanky, but the late lunch crowd was casual enough that I didn’t feel like a total tourist (even though I was totally rocking the sneakers. Let me live in my denial). The place was still pretty full when I arrived, even though I was starting a late lunch, which made me glad I came late so I didn’t have to wait for a seat at the bar to open up. Some of the late lunch crowd was starting early happy hour with wine for lunch, which made me do a double-take. Wine at 1:30pm? Did they have kegs and eggs out back, too? But hey, they were keeping it classy. No one started singing out loud or dancing on the bar. 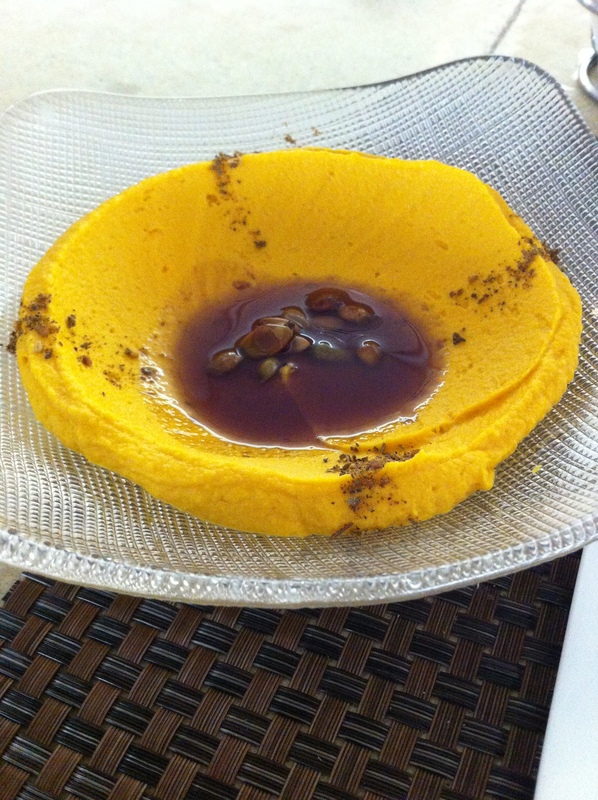 Appetizer: Butternut Squash Hummus with some kind of amazing bread. I wouldn’t usually even get an appetizer when it’s just me going to lunch. But when I saw Butternut Squash Hummus, I couldn’t resist. I love butternut squash, I love hummus, this was a no-brainer. I could have been satisfied with just the delicious bread and hummus. But there was more. Main dish: Falafel burger described as an olive oil brioche bun, chickpea fritter, tomato, and garlic yogurt sauce. Side of Maroulosalata: romaine, myzithra, scallions, dill, olive oil, and vinegar. 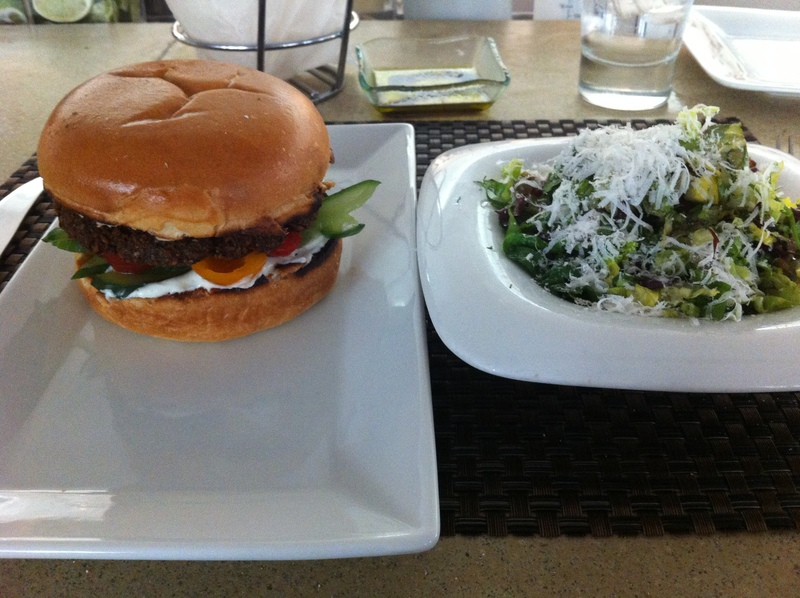 This was by far one of the best veggie burgers I have ever had. There was more bun than I needed, but I still loved every bite. The salad was light and refreshing, and not what I imagined based on the description. I was pleasantly surprised to find the romaine shredded. It was really easy to eat. That might sound silly. Obviously I could cut the romaine with my knife and fork if I wanted to. But sometimes it’s the little things that you remember months later. And I clearly hated it. Is it bad manners to eat every last bite? At home that was a prerequisite for leaving the table. At school it was praised and got you to recess a little faster. And I could probably blame some of that for the extra 15 pounds I don’t really need…. Oh well. That’s why I joined a gym. 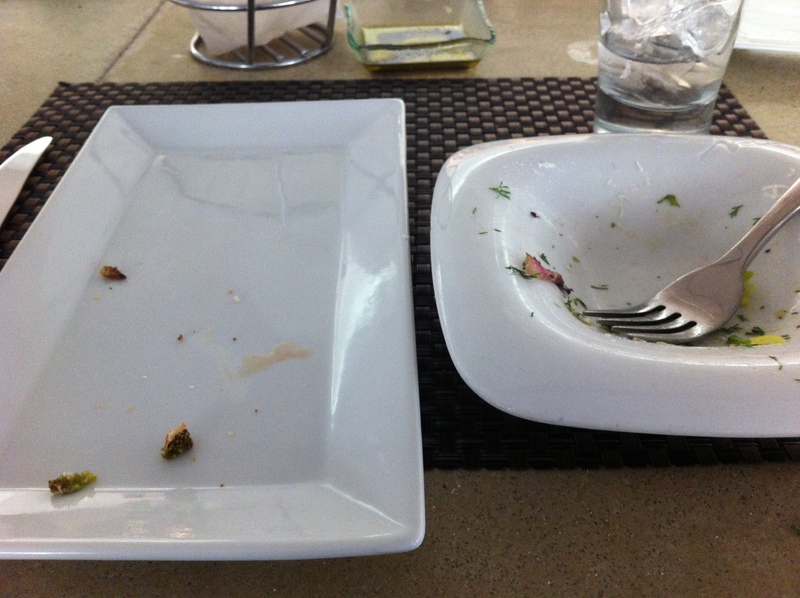 Love the photo of the empty plates!